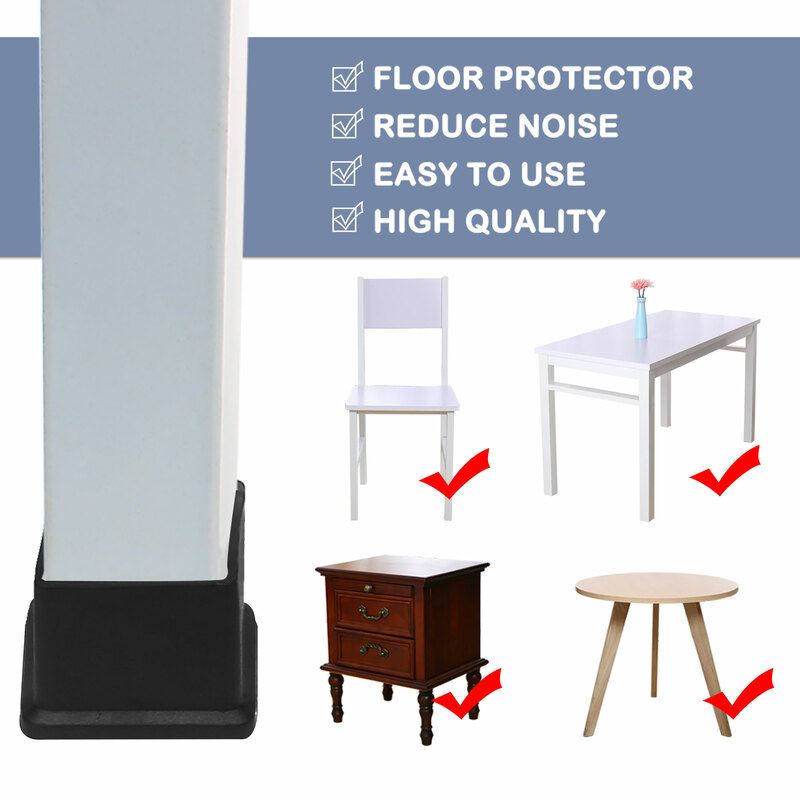 Leg caps are designed to make the movement of furniture items with a smooth gliding experience, anti-moisture, avoid scratch when placed on different surfaces such as tiles, carpets, parquet floors, and cemented floors and so on. The leg tips are constructed from PVC that ensure smooth sliding when moved across the room. As a result, the annoying sound is eliminated. 1. PROTECTOR - Used for rough furniture feet, makes it more smooth, so that prevent your floor surface from scratching, and keep furniture balance, items on desk or cabinet do not slide easily. 2. EASY TO USE - Compared with nail pads, has the advantage of easy install and do no harm to your furniture. More maintainable and last longer than stick-on pads. 3. WATER RESISTANCE - This feet cover can keep it out of the water, so that water can not enter the inner of the furniture. 4. HIGH QUALITY - PVC material furniture feet cover is very dense and has good tensile strength, resists impact deformation very well. 5. APPLICATION - These leg caps can be used on home, office, hotel, restaurant, apartment, garage. Suit for furniture legs. Typically used on tables, desks, hallstand, chairs, cabinets, sofas, benches, armchairs, folding chairs, stools, and so on. 1. There may be slight distortion when you receive the goods, however it does not affect the use, please make sure you don't mind. 2. Variability of 1-2mm is possible due to the measurement process. 3. Due to the light and screen setting difference, the color of the item may be slightly different from the pictures. 4. Please check your furniture leg dimension to fit the furniture feet cover before buying this item. 5. If mind the smell, you can leave them in an air circulate place until the smell is over before using it.